From a more detailed perspective, between March 2017 and March 2018, Canadian retail sales rose 4.5% for butter, 4.4% for cream, 3.3% for cheese, and 0.6% for yogurt. 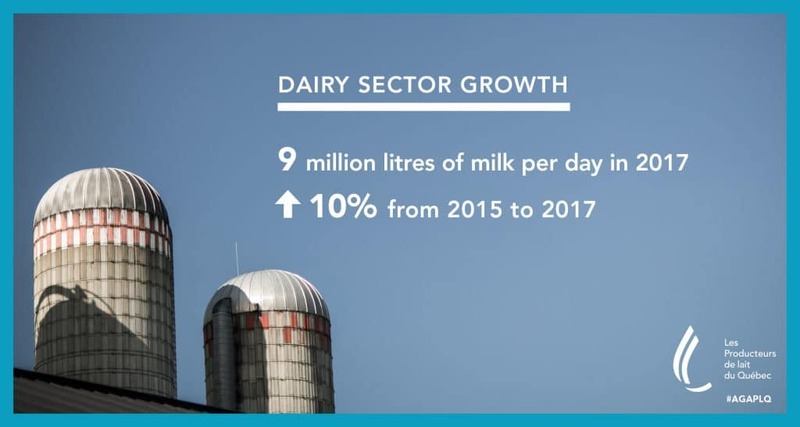 These increases more than compensated for the 1.8% decline in overall fluid milk sales, a common trend in many major milk consuming countries. Despite the decrease in fluid milk sales, 3.25% milk sales climbed 7.9%, even though they had been in decline from the 80s until 2012. Organic milk sales also rose, increasing 5.8%. “Our evaluation of market requirements inevitably has to take the effects of the Comprehensive Economic and Trade Agreement into account, and this includes cheese imports, which will reach nearly 6,000 tonnes in 2018,” added Mr. Letendre. In fact, the Comprehensive Economic and Trade Agreement (CETA), which came into force on September 21 between Canada and the European Union, not only hurts milk production, but also the cheese processing sector. Every year until 2022-2023, thousands of additional tonnes of cheese will displace our production. Due to the 17,700 tonnes of European cheese that will be imported, Canadian dairy farmers will ultimately face a permanent annual loss of $100 million. the coming into force of trade agreements“.